And that’s what this traditional Chinese recipe is: easy… Too easy! And too good home made to go back to the greasy/chemical restaurants versions (in Italy at least!). 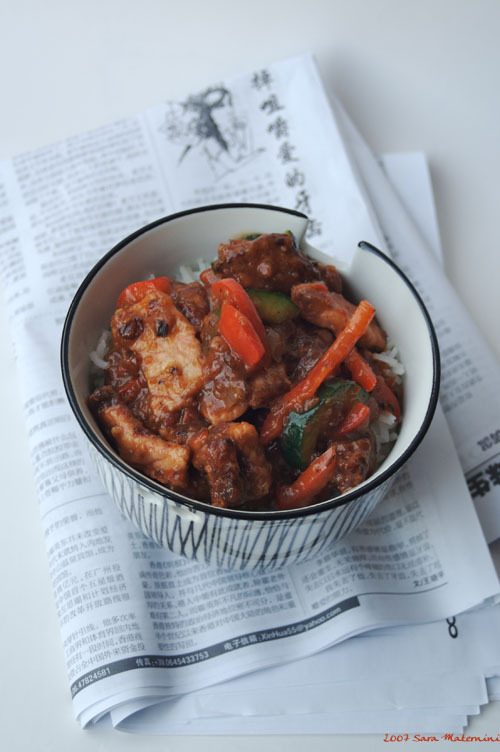 Among the two or three different recipes I was consulting on my cook books to make Sweet&Sour pork, I came across this one from Recettes Chinoises Marabout chef I’ve bought last time I was in Paris. What appealed to me was the fact that the pork stripes were dipped in plum sauce before to cover them with cornstarch and fry them in hot oil! And that’s the real trick!!! For the rest is quite easy, as I was saying! You slice some onions and some peppers. Even better if you have some pineapple, with its juice. Stir fry onion and pepper, add soy sauce, tomato paste, vinegar, pineapple, pineapple juice, and then the fried pork. Stir until thick and shiny. Serve over a bowl of steamed rice. Enjoy easiness! It’s summer after all! P.S. Have you notice the summer issue on the side bar? Run to buy it!!! Looks delicious Sara! And so easy! Nice one! Chinese food is easy!! I hope more people cook Chinese like you.